If you peruse this list a trend emerges – this card interferes with Criminals, perhaps disproportionately. Now, cards from all three factions are listed; however, there are more cards criminals need and splash for that are affected. Notable is the neutralization of account siphon, desperado, security testing and data sucker. These are tools that Criminals, especially Andromeda, depend on to maintain efficiency. Furthermore, much of the criminal strategy in general involves getting more value from runs on central servers. The Anarch cards included on this list are also important to their native faction, but if you are playing an Anarch ID you also have access to imp, which is a significant leg up against crisium grid. Consider also that datasuckers are less utilized now by Anarchs with the rise of knight, crypsis and overmind based decks. In addition, no important Shaper cards appear on this list as most players favor R&D interface over makers eye and indexing is rarely pivotal to a strategy. For these reasons I believe that this card disproportionately impacts criminals. Shapers do not necessarily apply early pressure, Anarchs aim for disruption all game, but Criminals depend on early aggression and getting more value out of their early turns than the corp. Dirty Laundry, account siphon, legwork, desperado, and security testing take advantage of the light ice state in the early game to gain more money and tax the corp by forcing them to rez everything. In the early game, putting a crisium on archives can shut down Andy and her dirty laundries or Gabe and his sneakdoor beta as well as the most frequent target of security testing and with the added bonus that a 5 credit trash is a huge tempo hit for an early game runner. The developers have again given us a card that is good for archetypes that aren’t popular right now, but unlike manhunt, crisium is directly targeted at runner archetypes that ARE popular including: Andromeda, prepaid katman and Ser Gabriel. If this card can make it into the meta with its low influence cost and utility it COULD cause a shift in the tier one runner decks and that is an exciting prospect. In real terms crisium grid is not good for all decks. NEH and RP would not necessarily get value from this card because they run light on ice and establish many other servers to run against. 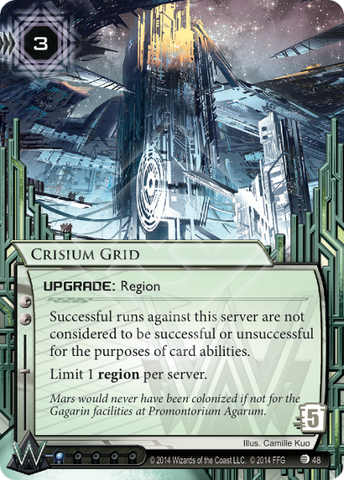 Also, if you are running SEA Source you definitely do not want crisium grid in play, making it a poor choice for Weyland kill decks. Certain decks, such as blue sun and HB glacier would utilize this card to reduce the impact of runs while they are setting up. On to playtesting, the synergy I find most compelling for crisium is off the grid in Blue Sun. 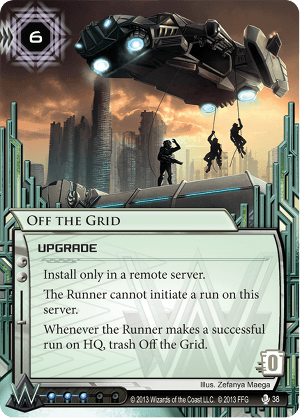 Off the grid was always difficult to use because one run into HQ was not a big deal and its cost was so high. With crisium they have to make one run, pay five credits to trash crisium, then run again. This tax coupled with Blue Sun’s ability to take off the grid back into HQ for a refund makes off the grid not only viable, but potentially dangerous. This week’s deck will be centered around this idea but it is important to mention that Tennin Institute wants to marry this card. If you go to NetrunnerDB there are several decks that have been built using the synergy of Tennin and Crisium that are quite effective. A couple of key card choices include: RSVP which protects the crisium early. Ash which goes into the remote adding an additional tax to steal the agenda after making your two runs on HQ. Interns can be used to put a crisium or off the grid back into play immediately after its loss. And Taurus goes on HQ to hopefully kill a console or maybe a RDI. I have played this deck already and it is performing admirably, it is just hard to pilot compared to standard glacier decks – which is another reason I chose Blue Sun, which allows me to rearrange ice to craft the most taxing HQ possible in the mid and late game. It is fun to play and people certainly do not expect it. I like this. What do you think about finding influence room for an Uroboros for use on HQ? I think that with eater coming out, and how well crisium grid deals with all of the tricks that those decks will be bringing in the upcoming meta, that this card is going to see much more play. 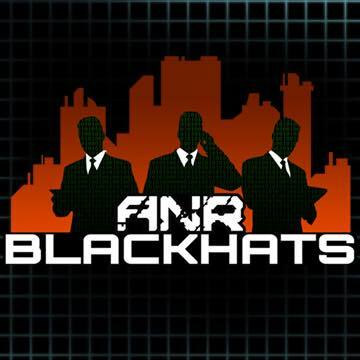 Anarch may be a good faction to use it against as well very soon!